St. George Street changes names south of College, and is then called Beverley St. The Polish Hall is located one block south of College St. on the north/west corner of Cecil St.
Free parking is available on Beverley St (after 9pm). Also there are 17 free parking spots underneath the building, plus there are are 15 parking spots in the parking lot on the south side of Cecil St. across from the Polish Hall (just pick up a parking sticker for $3 from us). 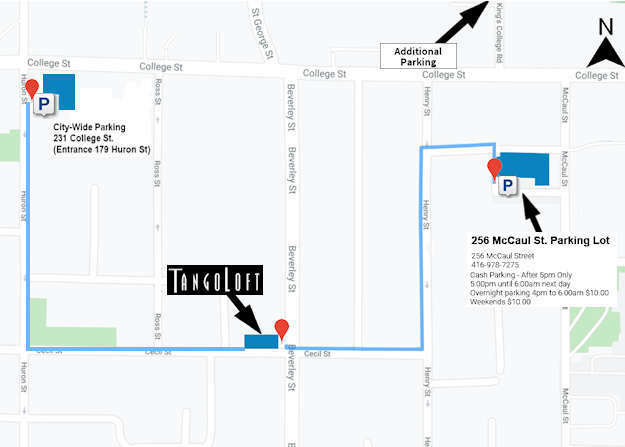 There is also paid parking (underground) for over 280 cars within a 5 minute walk at (213 Huron St.) for a rate of $10 for evening parking (4pm-6am). Subway: From the Queen's Park station (on the University line) you can walk to St. George. (4 blocks), or take the College street car to St. George. Then walk south one block. Street Car: Take the College street car and get off at St. George. Then walk south one block.